This year’s report again shines a spotlight on the ways mobile is altering internet consumption. While the presentation didn’t surprise many—mobile is growing at a much faster clip than internet usage as a whole—the statistics shed a lot of light on why mobile is so successful and how some trendsetters are using those trends to their advantage. 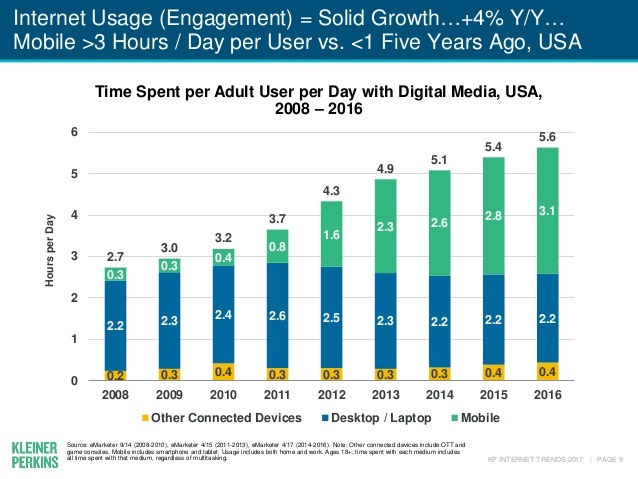 Mobile usage is winning a larger piece of the internet pie than ever before. Because your colleagues and employees are increasingly using mobile to access the internet, you’ll need to engage them on their terms. Train by Cell can help with that. Train by Cell is the top provider of mobile workforce engagement tools. Communicate with various groups of employees or managers, or one-on-one using text messaging (SMS and MMS). Send your communications right away or schedule them by time or sequenced workflow. The control is completely yours. Our services are also easy to onboard and administer, saving your company from bringing in your IT team. At a time when the vast majority of emails go unopened, nearly 99 percent of text messages are read within a few minutes of delivery. Our suite of services empowers clients to reach employees using our proprietary Mobile Web Authoring Platform and Text Messaging delivery platform. Store any kind of content, from employee handbooks and training manuals, procedure how-tos, corporate structure and employee bio information and calendar items. The content can take the form of text pages, videos, audio and other rich media. It’s stored in the cloud and hosted on mobile-friendly web pages your employees can access at any time. More than ever, mobile user engagement is incorporating gamification to better reach and convert users,” Meeker continued. Through traits like puzzle-solving, competition, project completion and exploration, engagement and learning is optimized, she said. That’s why Train by Cell offers gamification and competition-inspiring features like scavenger hunts, quizzes and polls. You can even conduct compliance testing using our platforms. It’s one of the many uses available with our suite of services. Want to learn how your organization could benefit by kickstarting your mobile engagement strategy? Sign up for a FREE 20-minute demo. Call us at 415-615-0150 or email at info@trainbycell.com.